Apacer, a manufacturer of memory cards, has unveiled its latest product – ultra high volume microSDXC UHS-I U1 memory card with 128GB capacity. This card boasts an astounding read/write speed of up to 80/20MB/s, exceeding that of the competition and satisfying user demands for massive data storage, be it having every TV episode of their favorite drama series on the go, making liberal use of the continuous shot function with their smartphone or even recording Full HD videos. Apacer is dedicated to the pursuit of excellence and innovation, and is proud to deliver the ultra high 128GB capacity storage card with the fastest read/write speed in its class, revolutionizing device performance and user experience for mobile devices to unleash the true freedom meant for mobile lifestyles! Smartphones and mobile devices have become electronic products with the highest usage frequency and duration in our modern lives. The smoothness of device startup and data access is the key factor influencing user experiences. 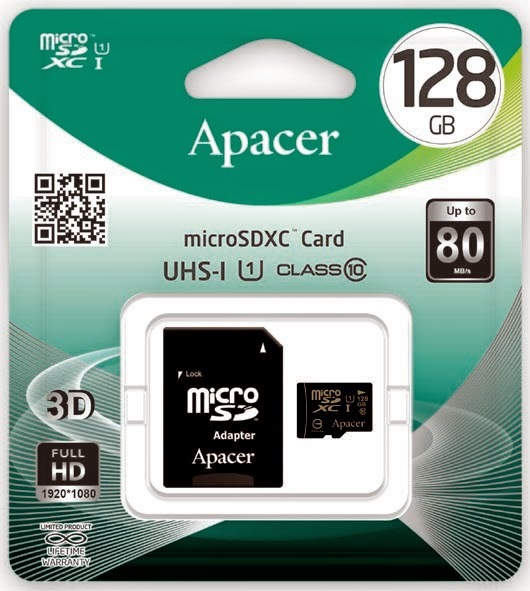 The Apacer microSDXC UHS-I U1 128GB memory card has a reading speed up to 80 MB/s and a writing speed of 20 MB/s that exceed its competition by a huge margin. The random read/write speed of Apacer's memory card is also top of its class, offering the smoothest user experience when checking out Facebook updates, taking photographs, recording videos, browsing photo albums, surfing the web, navigating on maps or playing games. Significant reduction in waiting time is provided at every instance, achieving substantial time-saving benefits after extended use. Many smartphone and tablet users are often vexed by the inadequate storage space offered by their devices. Social networking platforms such as Facebook and Instagram have given rise to the habit of instantly uploading of photos and storing everything in sight, while increasing camera resolutions have made photograph files larger than ever before. Full HD video recording deemed necessary for every major flagship smartphone models has become yet another monstrous storage hog. It is not surprising for valuable storage space to be taken up by these huge pictures, videos, and audio files, making data cleaning a frequent and annoying chore. 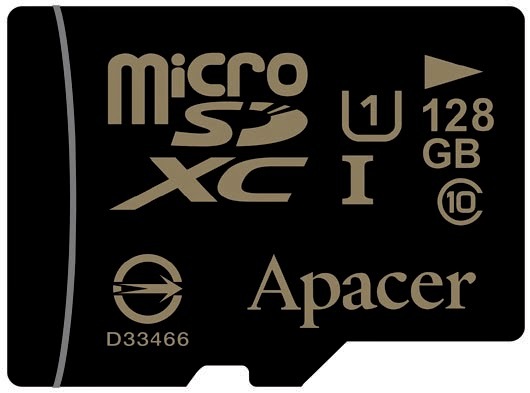 Apacer's newest microSDXC UHS-I U1 memory card has a storage capacity of 128 GB, allowing it to accommodate 32,000 JPG photographs and 45.6 hours of 720p HD videos. This solution allows photography enthusiasts to pursue their hobby without fear of using up storage space and gives mobile lifestyle the freedom it deserves! Additionally, this product series of microSDXC UHS-I U1 include a range of capacities of 8 GB, 16 GB, 32 GB, and 64 GB that users can choose from. Apacer's memory cards are the best and indispensable accessories for your mobile device. alternative easy to carry mobile storage. perfect microsd card storage, dami mong malalagay dito. kaya lang you need high-end smartphones for you to used it or compatible with the device.